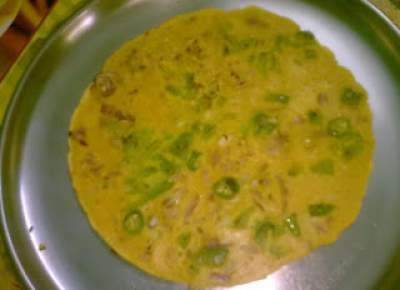 This is a nice variation to the normal uttapam where you need to prepare the batter in advance.So this can be done without any preparation and in no time..
Chop the onion,green chillies,capsicum and coriander finely. Take besan in a mixing bowl.Add salt and turmeric powder. Add water and get it to a pouring consistency. Drizzle some oil.Pour a laddle full of batter on the pan. Let it spread on its own.Sprinkle the chopped onion,chillies,capsicum and coriander leaves over it. After sometime flip it the other side and cook.